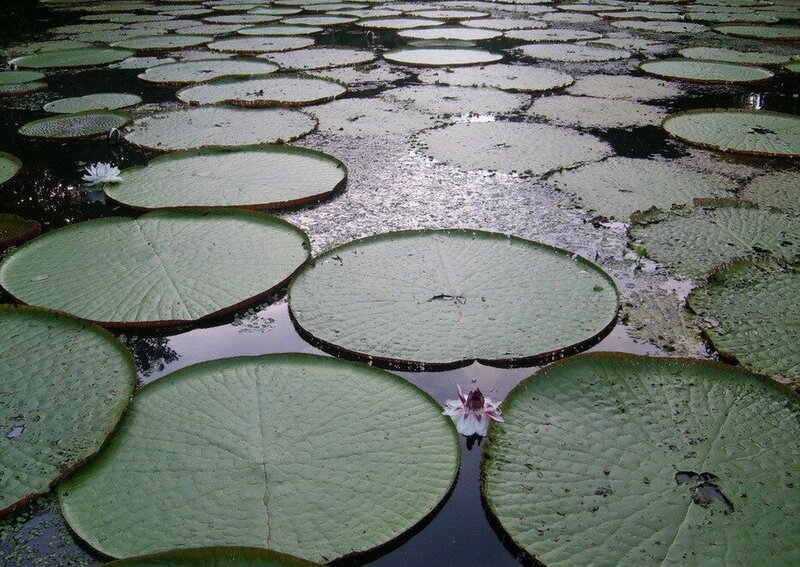 Giant water lilies Amazon: natural umbrellar? 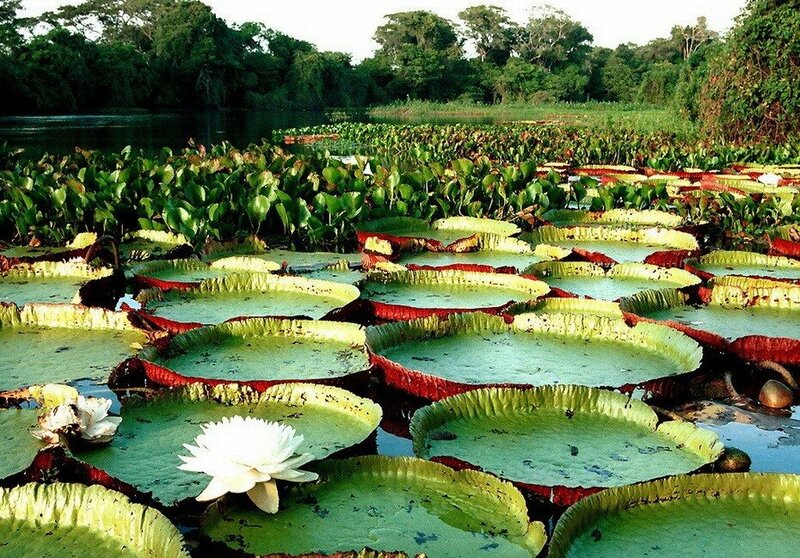 Amazon - an area in the Amazon basin in South America. 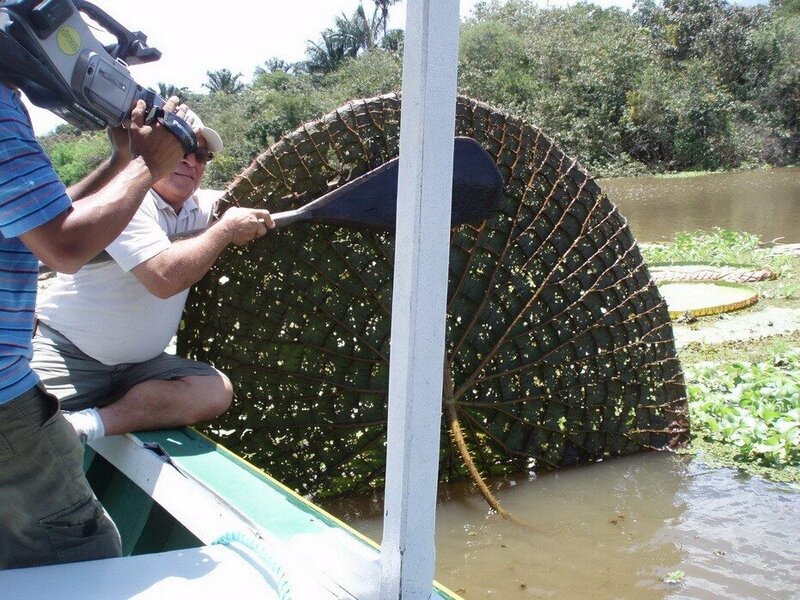 That's where the giant water lily Victoria grows Amazon (Latin: Victoria amazonica) or Victoria Regia (Victoria regia - royal Victoria) - the largest water lily in the world. The diameter of the sheet up to 2 meters, although it can withstand loads of up to several tens of kilograms. 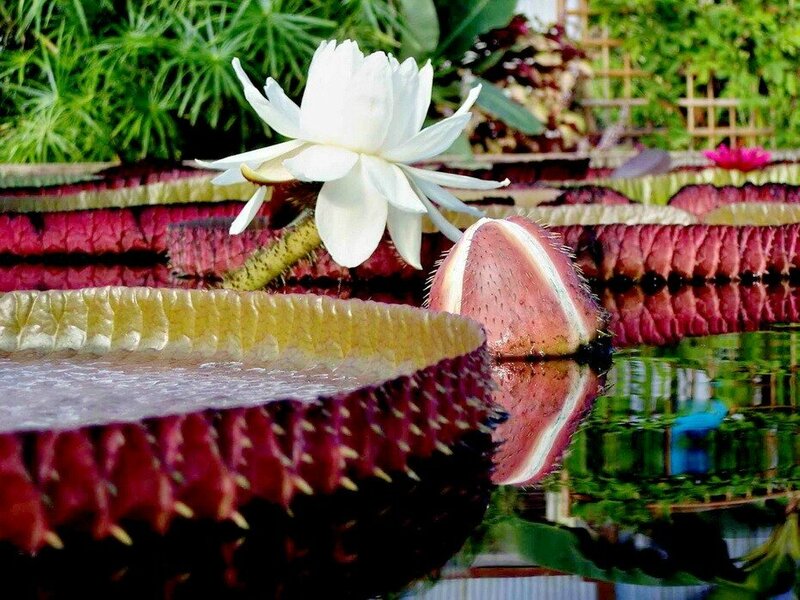 Thanks to these achievements, Victoria Regia was entered in the Guinness Book of Records as "the biggest flower on earth." 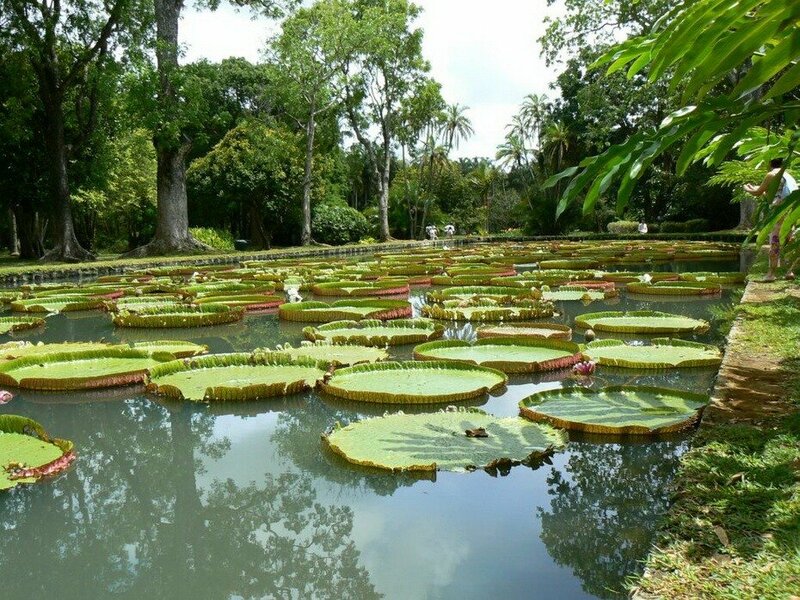 Its modern name of the lily was in the XIX century, when it was opened. 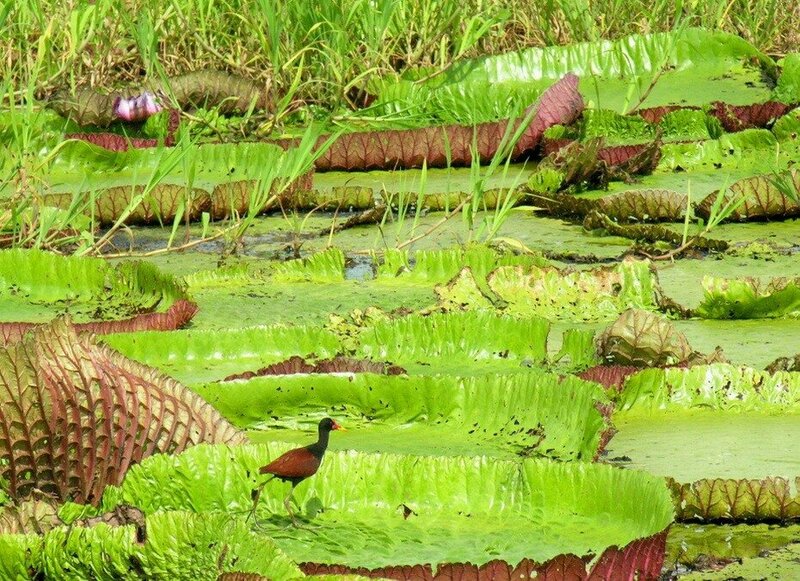 In 1836 a German traveler, Robert Hermann Schomburgk in the service in the UK, studied the forests of South America. It was he who discovered the mysterious plant. 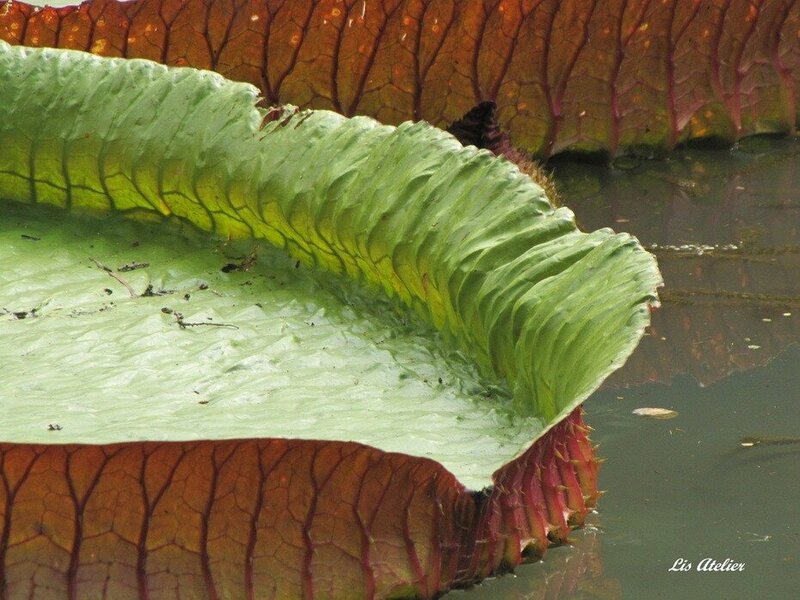 That's when the English throne went to the young Queen Victoria, was interested in botany. Her name Schomburgk and named his find: Victoria Regal. Victoria has a long threadlike roots. 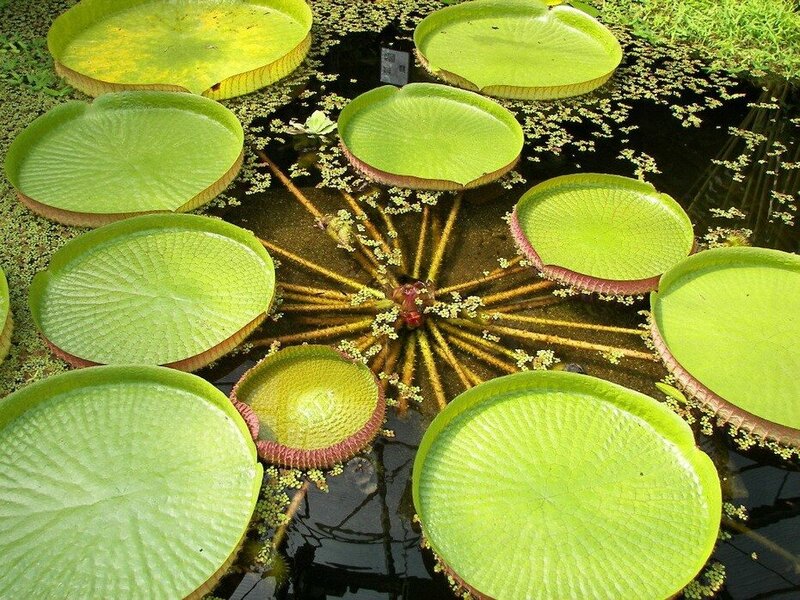 Its flower is placed under water and appears on the surface only once a year - during flowering, which lasts only 2-3 days. 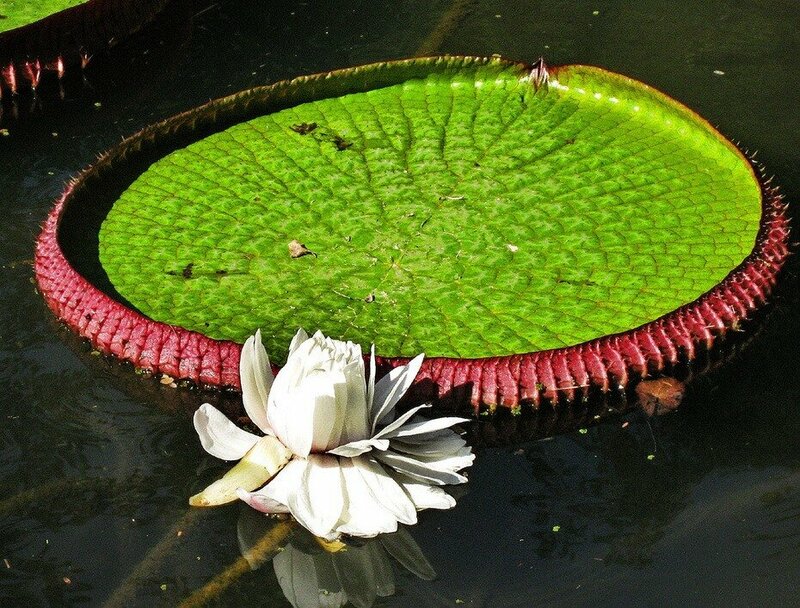 At this time, large flower lily in all its glory. 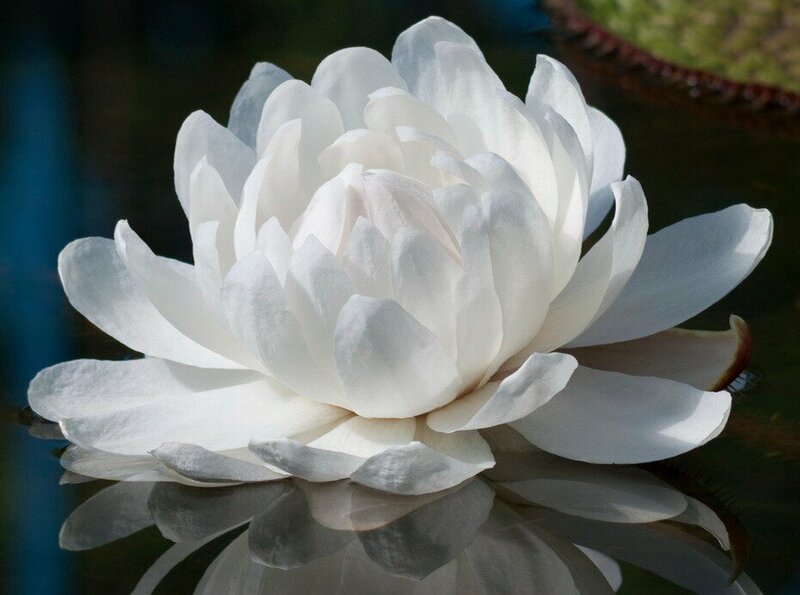 The white flowers of water lilies blooming giant with a sunset and close at dawn and hide under the water. At exactly two o'clock they again appear on the surface of the reservoir - now pink. 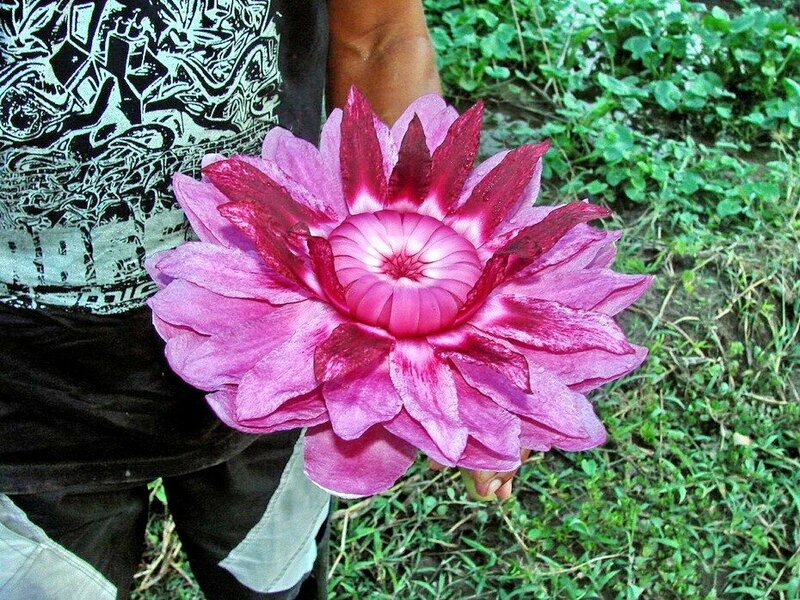 And in his last night flower is crimson or purple. After that, he falls into the water and finally dies. Here is a brief joy. 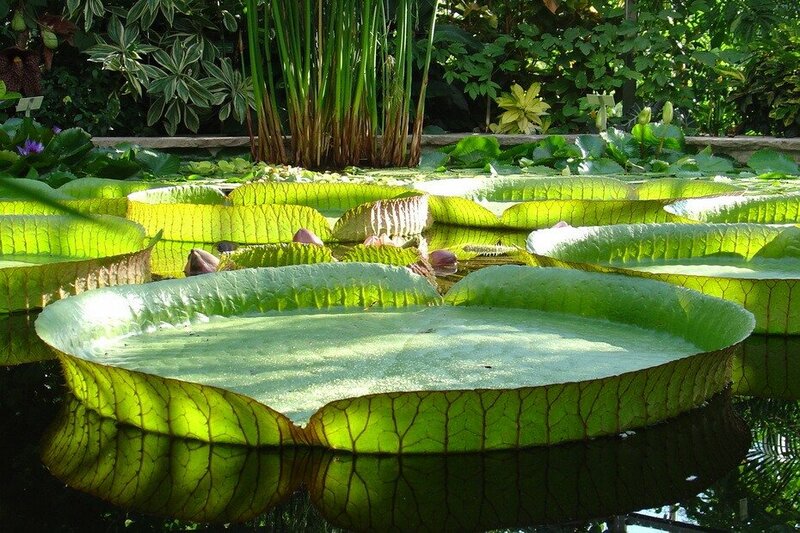 Lily itself can survive in nature, up to 5 years. Young is not The deployed sheet. 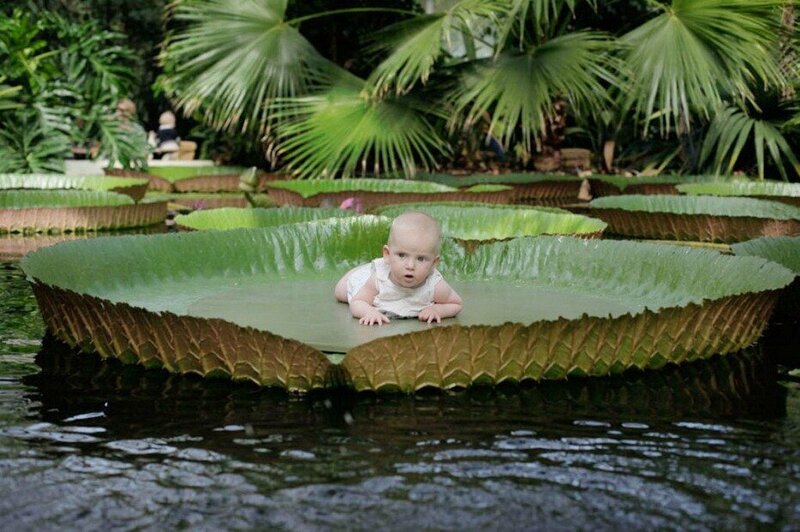 Nature took care of the protection of plants. 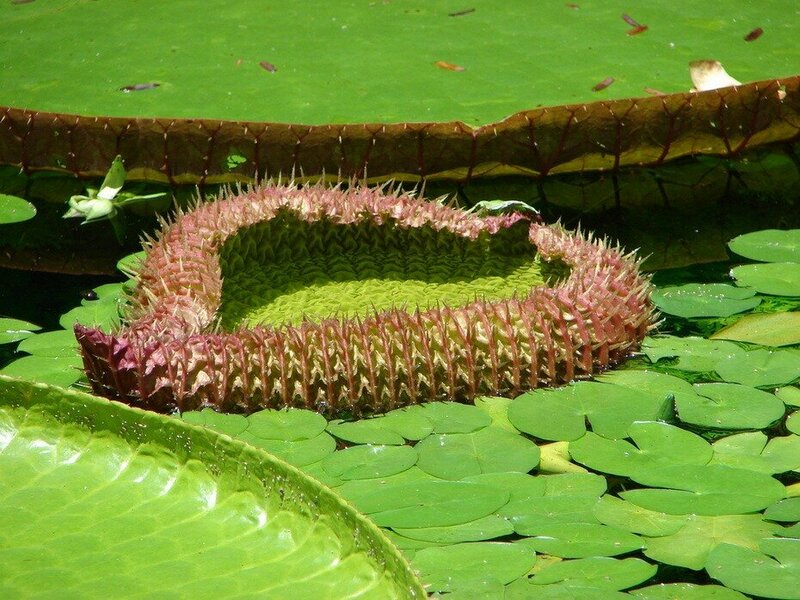 The outer side of the leaf, stem and flower is completely covered with sharp and long thorns that protect it from grazing animals and fish. 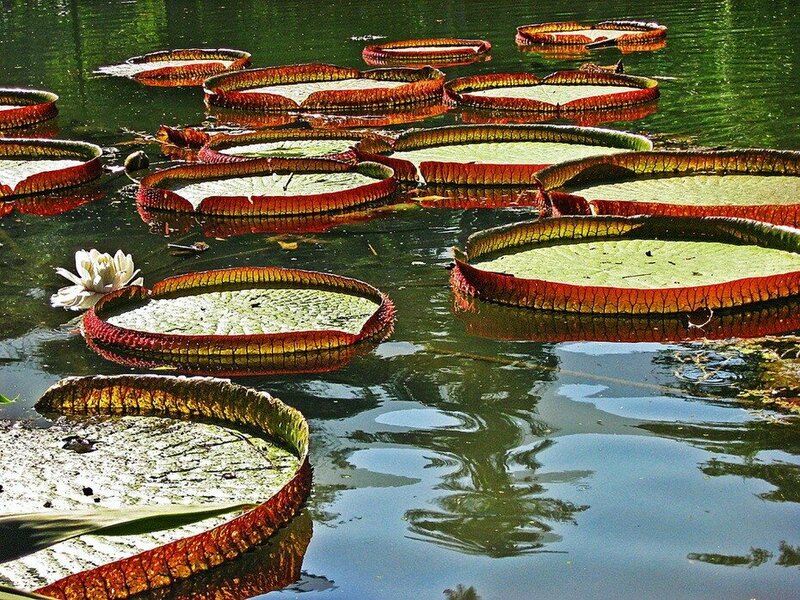 The surface of the Amazonian water lilies can withstand loads of up to several tens of kilograms. It is only necessary to properly distribute the center of gravity. 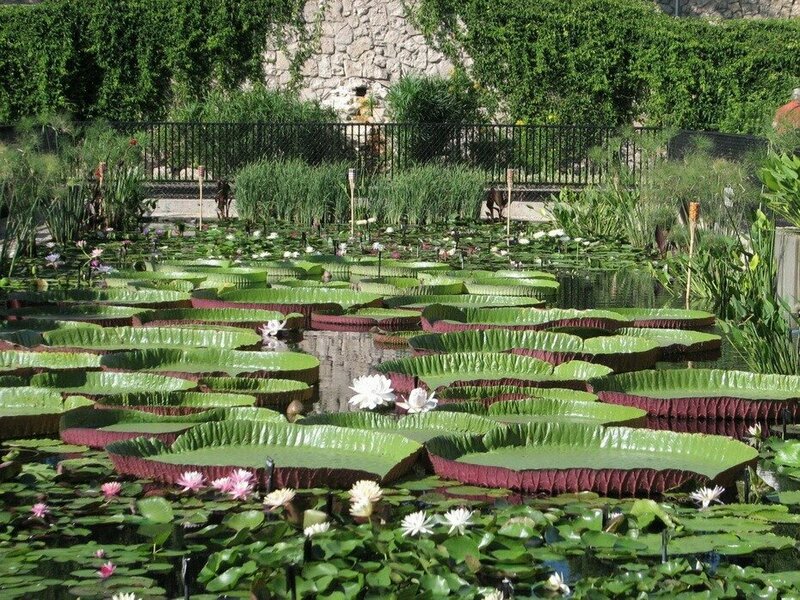 On the unusual features of water lilies are well known to local residents. 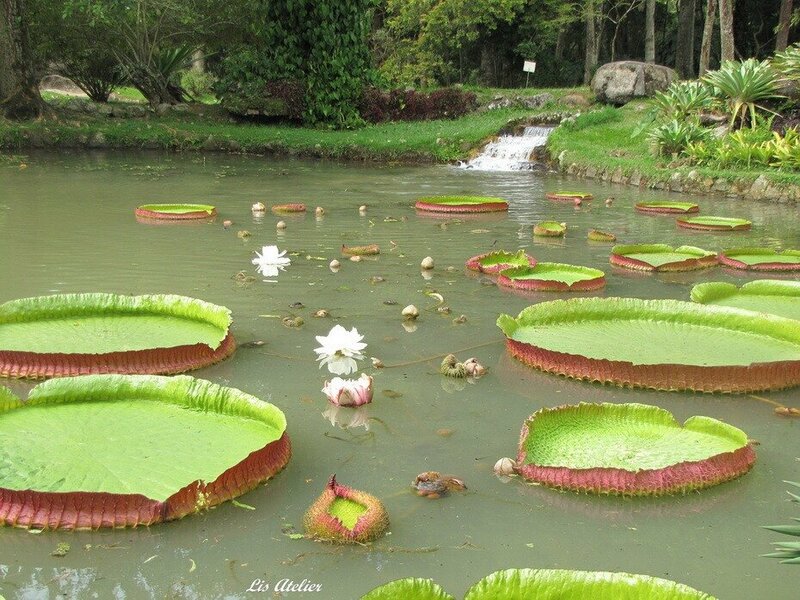 Therefore, they are rarely used as a water lily boats to ferry across a small river. 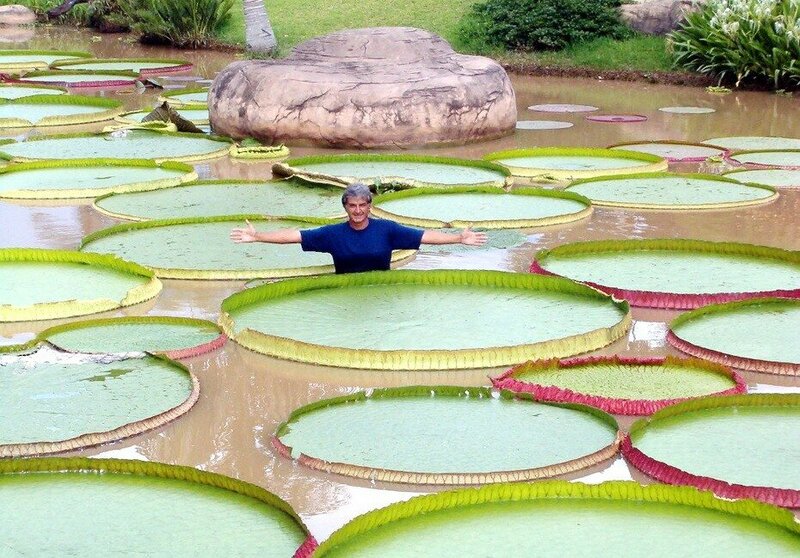 After the huge lily was found, numerous attempts have begun cultivation of this plant. But almost all of them failed. 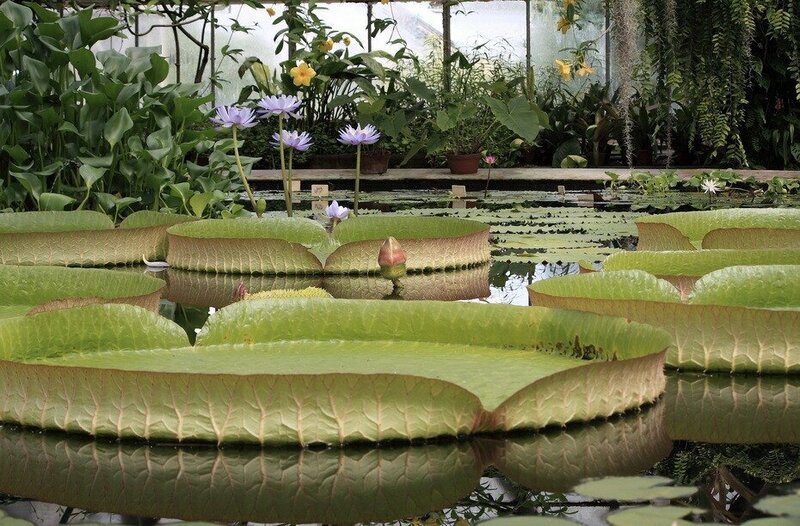 It was only in 1849, Victoria was first flowered in the Botanical Garden of the English city Chadstvorta.At the end of the last century, such attempts have been made by Columbia Botanical Garden. And in 1975, one of them failed. 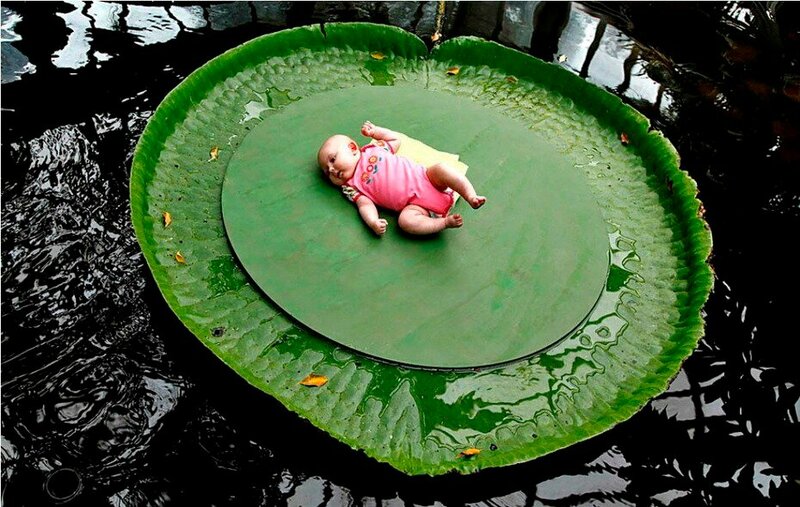 And after 20 years with the help of special light filters managed to grow a new plant fully.Now, in this botanical garden every parent can take a picture of her baby on the huge leaves of the regal Victoria. 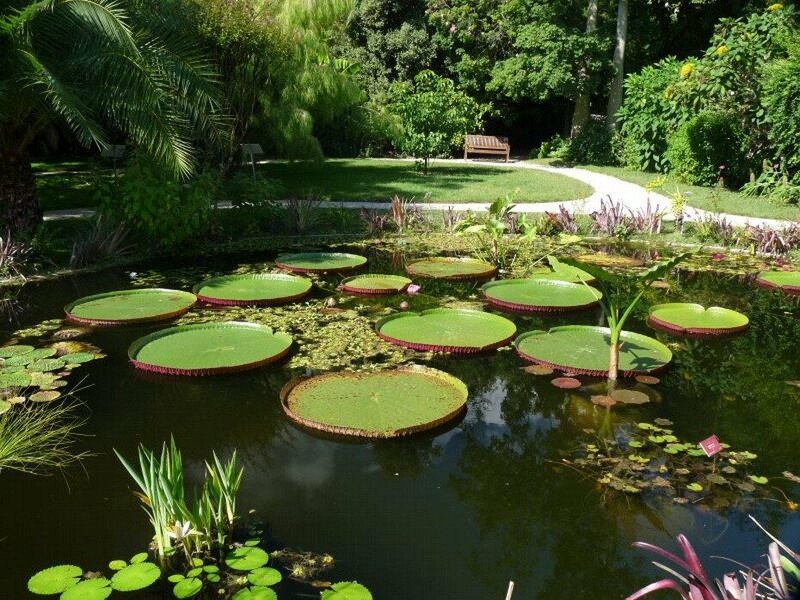 It grows in other botanical gardens. 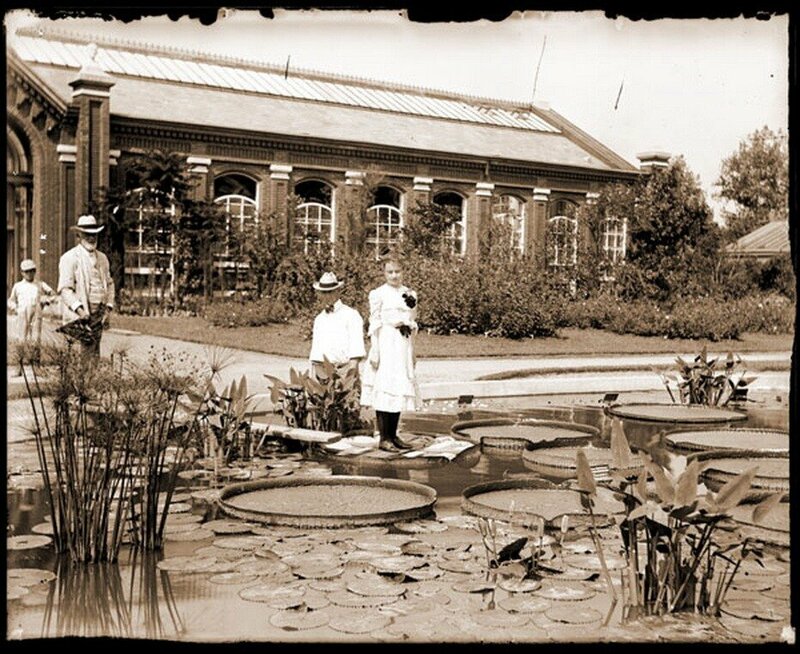 In particular, in the Botanical Garden of St. Petersburg, where Amazon is grown in Victoria in 1864. 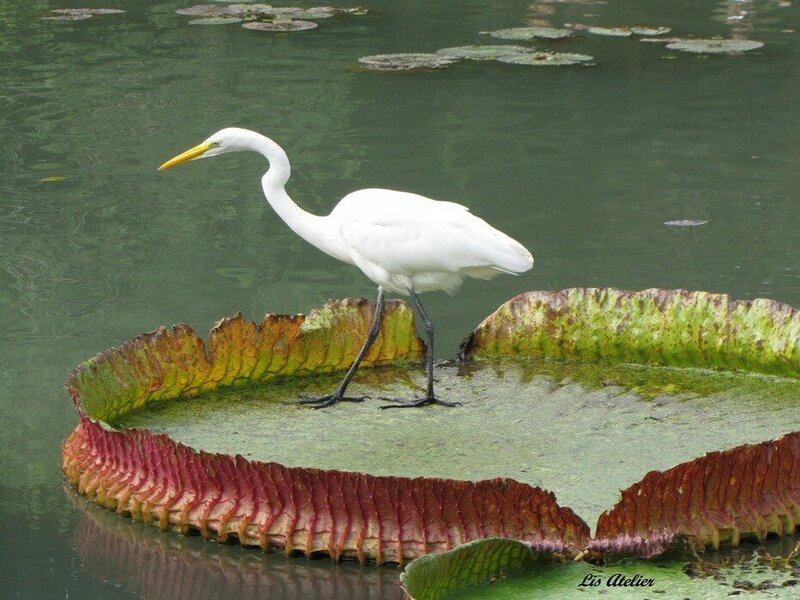 Natives have named this water plant, "upon," which in their language means "frying pan for the birds." 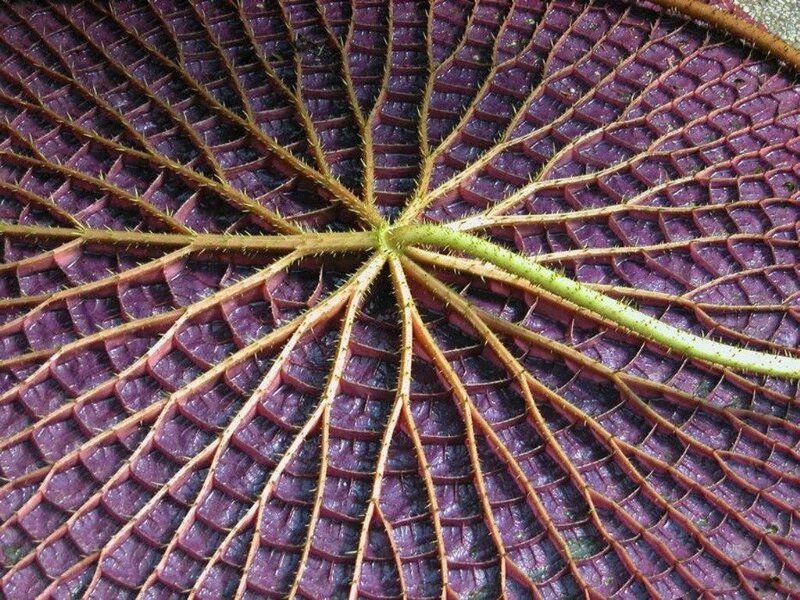 Leaf edges are bent at right angles to the leaf surface. 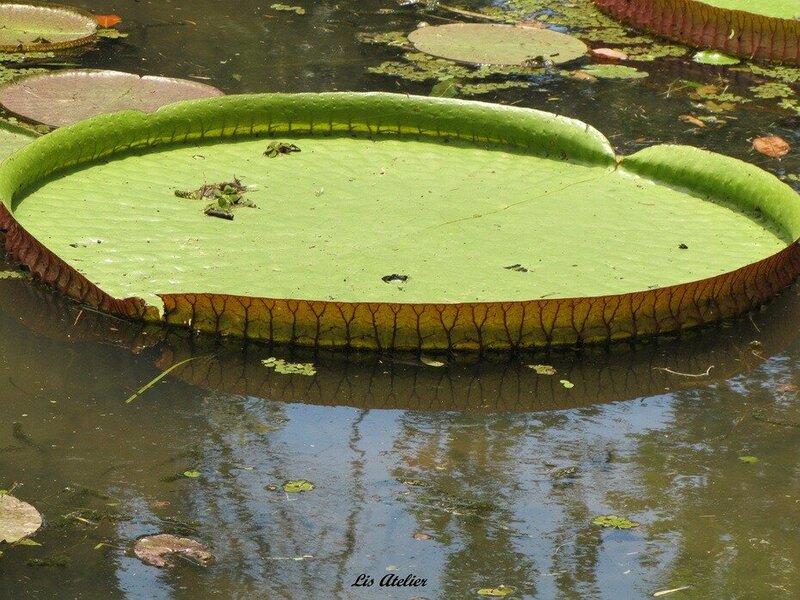 In order to not accumulate rain water in this huge "dish", the lilies have small holes - weirs, through which all excess moisture goes into the leaf surface. 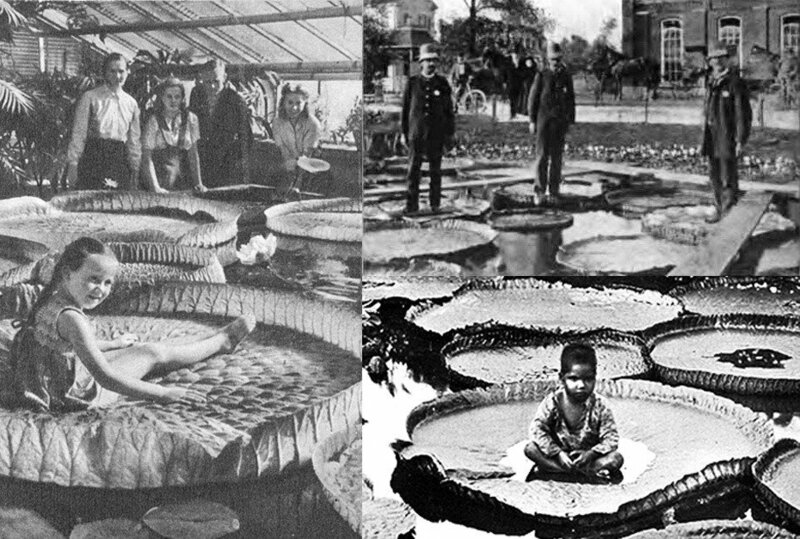 Residents of the Amazon, but the aesthetic pleasure derived from the Victoria and quite tangible benefits.Under the water it formed large fruit containing small black seeds. Local Indians used them for making a very unusual dish tastes like popcorn. The root of the plants are going to matter - dried, milled and baked from the flour variety of goodies. 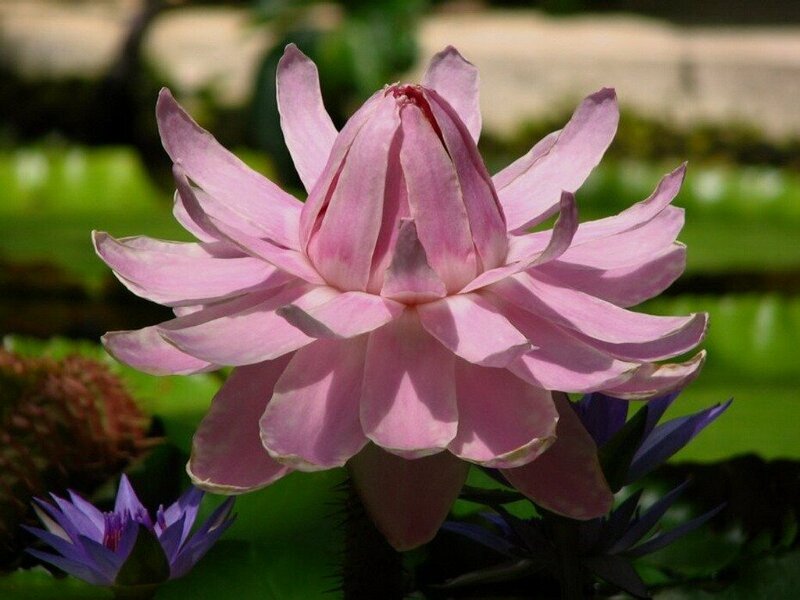 Have Aboriginal and legend connected with the water lily. It states that the chief's daughter Nyah, I learned one day that sky sometimes takes a month for his wife ordinary girls. They learn the joy of love with him on the high hills, and then lose their mortal shell and becoming stars. Nyah Yearner months and love for a long time at night, ran through the hills, trying to attract the attention of her lover. Nothing came of it. And then distracted from the love she saw in the lake reflection night lights, rushed into the water. 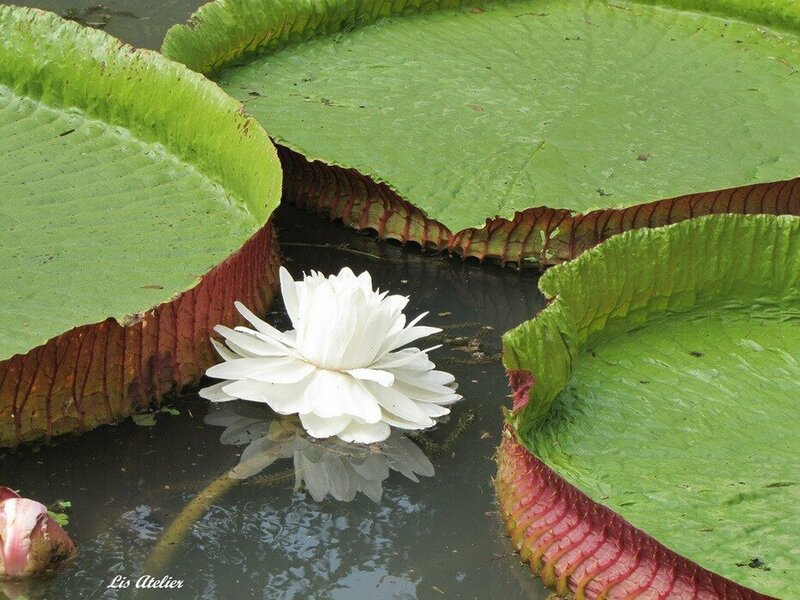 But the month was androgynous deity, and the second part of it - good Moon - took pity on the girl, she turned it into a beautiful flower and the leaves are made enormous that at night they got it as much as possible lunar affection. And to protect the plant supplied the thorns, which are dotted with stems, and leaves the other side.